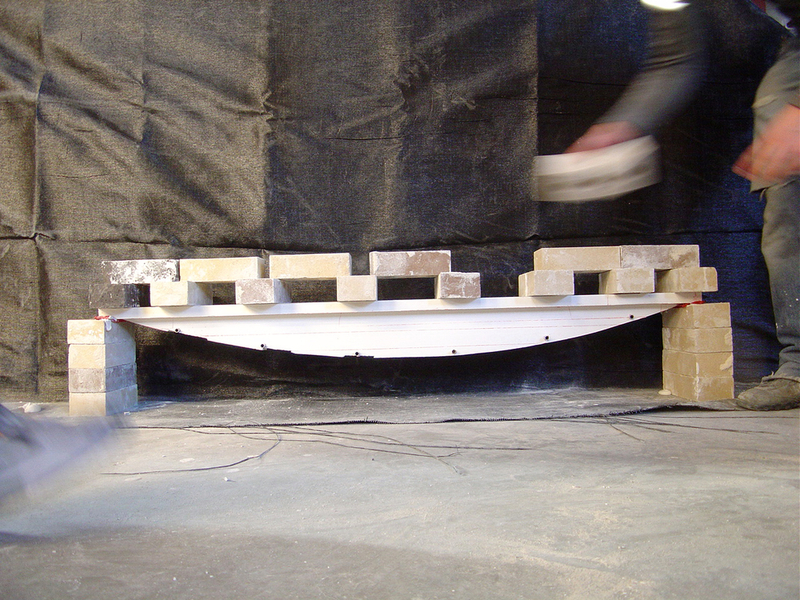 Seeking to test the capacity for fabric to reinforce concrete in a structure, an analogue test was set-up to explore this in a plaster model. 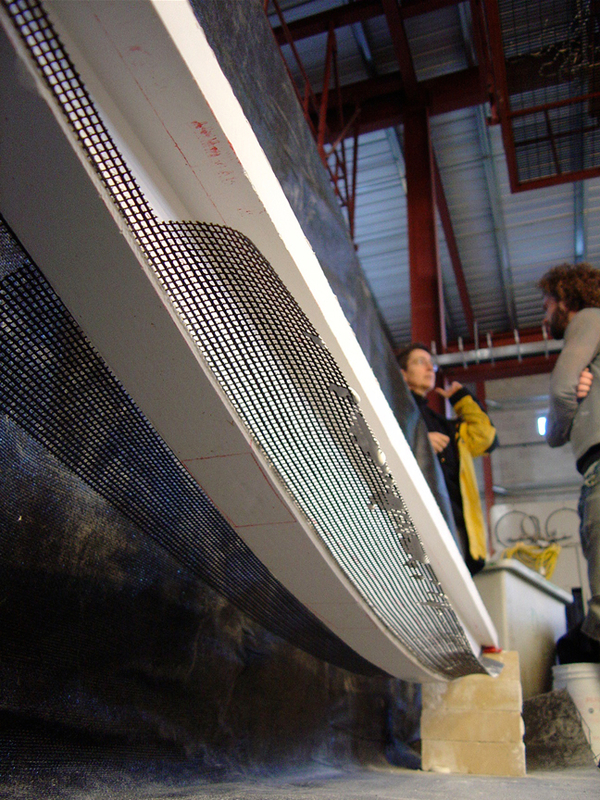 A beam was designed to cast a resin coated fiberglass reinforcing mesh to follow the force-flow of tension in a simply supported, uniformly distributed beam. 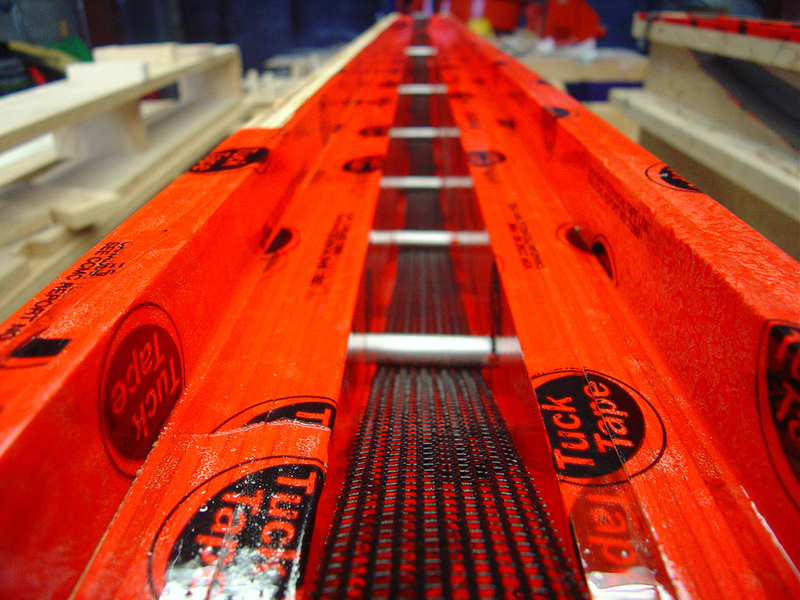 The reinforcing and the bottom edge of the beam followed a centenary form to match the path of tensile forces for this particular condition. This experiment tested two methods for guiding the fabric reinforcing, one by intermediary posts (Fig. 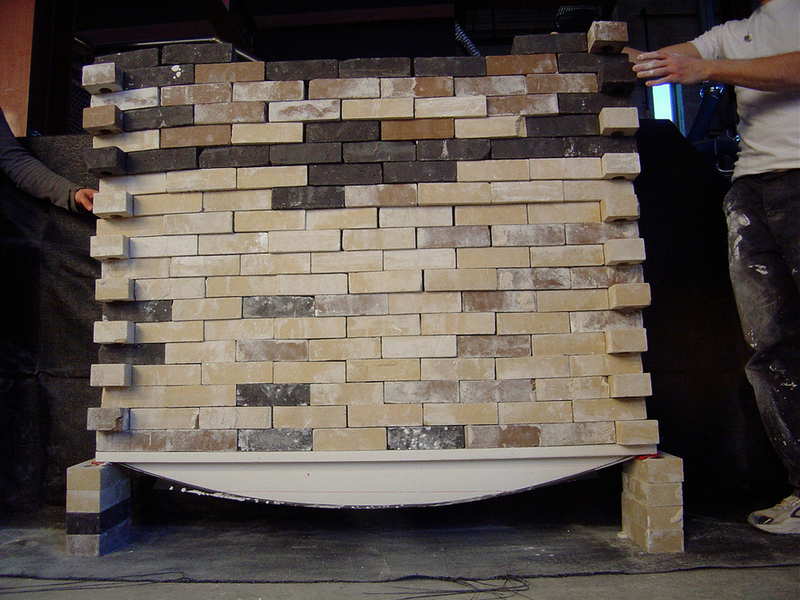 2) that held the fabric reinforcing in place, the other through a method of casting whereby the fabric is held in place by the rigid form work along the sides of the reinforcing path (Fig. 3). The tests revealed that in the post-guided fabric reinforced concrete beam, the failure of the beam (280 lbs.) was caused by the points of stress built-up at the posts themselves. The cracks resulted at each post, indicating that the introduction of the new elements reduced the strength of the beam. 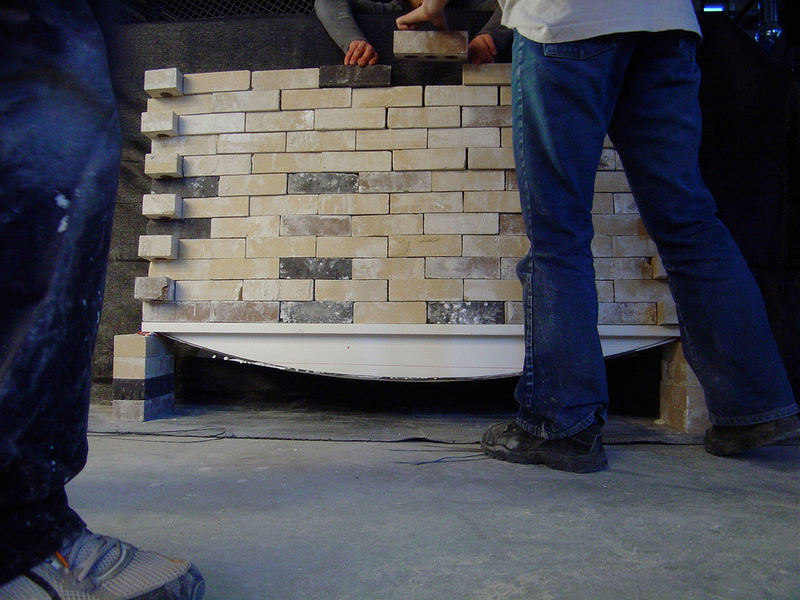 While the formwork-guided fabric reinforced beam was able to support the full load of the bricks stacked on top (735 lbs). 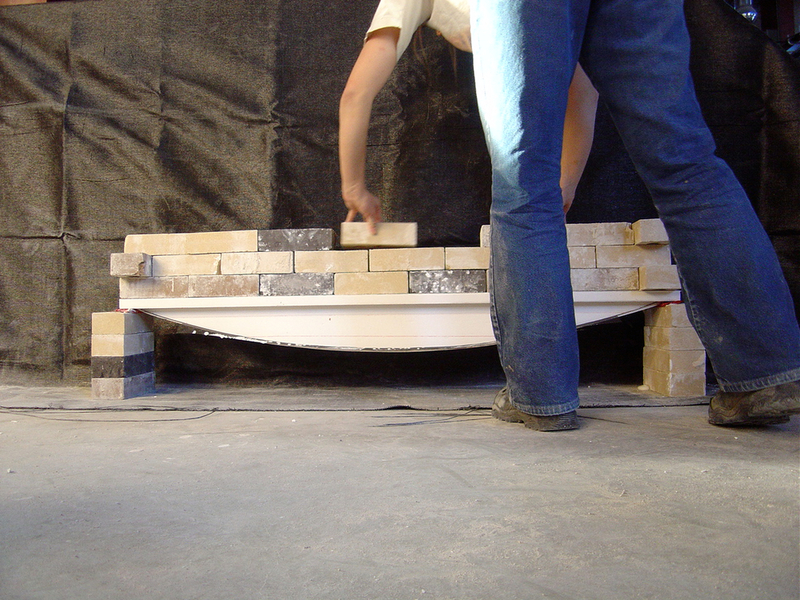 Although this test was not meant to determine an ultimate strength, it was useful for discovering an appropriate construction technique to introduce fabric reinforcing for beams and other structural components.